Trachemys scripta elegans (Wied-Neuwied). Engraving made in 1865 by Karl Bodmer, who accompanied the authority on his expedition. 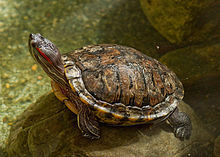 The red-eared slider (Trachemys scripta elegans) is a semi-aquatic turtle. It belongs to the family Emydidae. It is the most popular pet turtle in the United States. It lives in Southern United States. It is also found in many other places as an invasive species. They can be found in the US state of California where it was introduced. Rhubarb leaves are poisonous for them. Overfeeding may cause diseases for the turtles. ↑ Fritz Uwe; Peter Havaš (2007). "Checklist of Chelonians of the World". Vertebrate Zoology 57 (2): 207 - 208. Archived from the original on 2010-12-17. https://www.webcitation.org/5v20ztMND. Retrieved 29 May 2012. This page was last changed on 18 September 2018, at 01:03.